On January 20, 1924 a charter was granted by the Knights of Columbus to create a new council and one hundred and eleven men from our community participated in the ceremonies which exemplified them and they became the charter members of our Council. They chose the name of Joseph Barry, a young man of the highest character, for the Council’s own. 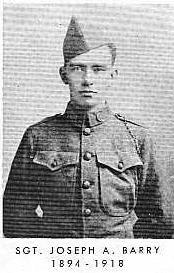 Joseph Barry was a local boy who gave his life during the First World War. The first meetings of the Council were held in the St. Ignatius School, but soon the Council needed more room. To accommodate its increased ranks, the Council purchased the house and property located at 65 East John Street in 1927. The Council held its meetings there for the next 24 years. The Edward J. Kenny Club incorporated as the Council’s real estate holding company and received its charter on October 15, 1927. In October, 1951 the gavel came down to signifying the closure of the John St. Clubhouse. It would be almost 10 years before we opened another meeting under our own roof. Beginning in January of 1952, after a few meetings were held in the St. Ignatius school cafeteria, our regular meetings began being held in the Veterans of Foreign Wars building on Grand Street. Exactly four years later, our meetings were again held In the St. Ignatius School on a regular basis. In the Fall of 1959 property was acquired opposite the Court House on Heitz Place and ground was broken. On June 4, 1961, amid a big celebration begun by a grand parade, our new Club House was opened at 45 Heitz Place. At the time we began meeting in the Heitz Place Club House, our membership exceeded 600. Development of morally upright youngsters has always been a goal of our Council and, in 1947, our Squires Circle was established. On April 1, 1997 the Council approved the establishment of a Columbiettes Auxiliary. Joseph Barry Council has always worked hard to be part of the strongest right arm of the Church, and with the glorious and prideful history we possess, we pray that the past shall only serve as a prologue to our perpetuity. If you ever have the opportunity to walk into the main lobby of the middle school on Jerusalem Avenue, look for the inscribed plaque commemorating the school clock tower to the memory of three young Hicksville men who gave their lives in World War I. The Hicksville Choral Society undertook the project and on Memorial Day 1925, just a year and a half after the opening of the school, the dedication took place. Previously these men were honored by community groups who took their names for their own in naming their local organizations. They were Charles Wagner, whose name was taken by American Legion Post No. 421, Walter Wheeler, whose name was given to the Hicksville Lodge of the Royal Arcanum, now defunct, and our own Joseph Barry, who, a year before, was chosen as the patron of our Council of the Knights of Columbus. Joseph was born on Pacific Street in Brooklyn on June 13, 1894. Later his family moved to Astoria and then, in 1914, James and Eileen Barry took their family, Joseph the eldest, Edmund and Eileen, to Hicksville. Joseph received his early education at the Holy Name of Jesus School on Amsterdam Avenue. He was employed by the Hicksville Lumber Company and later at the McKeon Lumber Company, which was situated at a location on Old Country Road which is now the entrance to the Delco Plaza at Broadway. He later worked for the State of New York as a chauffeur. He was a member of St. Ignatius Holy Name Society, Westbury Council of the Knights of Columbus (with his brother Edmund) and Company 2 of the Hicksville Fire Department. Both he and his brother took their Columbian degrees together in 1917. When the United States entered the War in 1917, Joseph attempted to enlist in each of the services but was turned down because of his poor eyesight. For the time being he contented himself with an enlistment in the Militia, a local home guard unit organized under the office of the County Sheriff to do patrol work in sabotage sensitive defense areas. When a notice from his draft board came, he was accepted for active service in the Army. He was assigned to Motor Transport Company 461 as an ammunition truck driver and later as its company clerk. He saw action at Chateau Thierry in September 1918. Then, suddenly, on October 25th he was taken seriously ill with cerebrospinal meningitis. On November 3, 1918, after nine days in agony, he died in the Army Hospital at Bordeaux, France, after receiving the last rites of the Church from his Chaplain. His commanding officer, Captain J.D. Southwick, wrote a long letter to Mrs. Barry relating in glowing terms what kind of a man her son was. He said, “I believe that every man of the company felt a distinct loss at his death.” Sergeant Joseph Barry’s body still rests in the American Military Cemetery at Contrexville, France. We have always had the distinct honor of having relatives of Joseph Barry as members of the Council. Edmund, his brother, was a charter member of the Council, James Barry, his son, was a member until his death and Heinz and Philip Baumgartner, his nephew and grandnephew by marriage, are counted among our current members.